Of course, the Arab Spring changed a great segment of the current political landscape around the region and that would never have happened without all protesters around the Middle East and North of Africa (MENA) who took streets. They have done a tremendous job to fight social injustice, corruption, inherited power and dictatorships. For the sake of freedom and dignity, they sacrificed a lot! Hundreds of thousands were killed, hundreds of thousands were wounded and thousands were Internally Displaced People (IDP) after they were met with violence and savage killing by "security" forces. Even till today, there are parts of MENA who are still fighting and struggling to gain their freedom. Their revolutions are still continuous. Bahrain, Egypt, Syria and Yemen are still revolting while we are about to mark the first year anniversary of the start of the Arab Spring; Tunis Revolution. 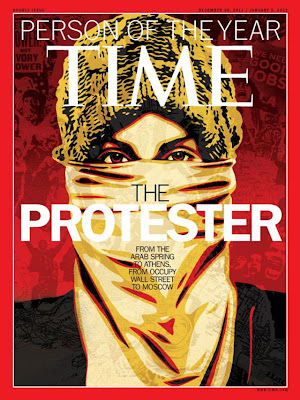 Those protesters inspired the whole world to take streets and claim their political, social, economical rights. I remember that earlier this year, a Chinese guy attempted to follow the path of the Arabs but unfortunately failed. I also remember that there were couple protests in Malaysia earlier this year inspired by the Arab Spring. The list is long .. Spain had several protests inspired by Tahrir square in Cairo. one can't forget the "Occupy Wall Street Movement" which transformed to "Occupy Everywhere Movement". Just recently, people in Russia took the streets to call for political evolution against Putin. Couple hours ago, I found on twitter that Time Magazine's person of the year for 2011 is "protester". I was so happy to read that. I thought, "Hats off to all fighters and protesters around the world who sacrificed a lot for the sake of social, political, economical, etc changes. May this be a new chapter for humans empowerment and enlightenment for a better tomorrow."